​Cosmo’s Midnight, Cut Chemist, Drapht, L D R U, Kilter, Kuren, KLLO, Peaches, Seth Sentry, Tash Sultana, Tkay Maidza, plus even more to be announced! There are just a handful of first release tickets remaining so those wishing to take advantage of first release prices are urged to grab their tickets from Moshtix whilst they’re still available! With the countdown to Southbound well and truly on, there’s still plenty of exciting news to come. The stage formally known as Coconut Club has now been moved to the main arena, sidled up along the other main stages with programming to reflect the growth in the burgeoning electronic and bedroom producer scene. Showcasing both profiling and emerging talent and complete with purpose built tent and production to match, the stage has officially been renamed Hightide and it’s set to go off. There are still local artists and DJs to be announced, our huge Commedia dell’ Southbound fringe, comedy and circus tent, plus triple j’s Unearthed competition and Southbound’s own Stagebound slot. Southbound is proudly working with the Margaret River Busselton Tourism Association to showcase some incredible “extra-curricular” activities that can be undertaken when in the stunning Margaret River region for the festival. Check out what’s on offer here and book in your experience now! First release tickets are moving very quickly and now with more names than you can poke a stick at, the allocation will be gone in no time! The rebuilding process from the devastating fires that led to the cancellation of the January 2016 festival continue to be a costly exercise in both time and money. 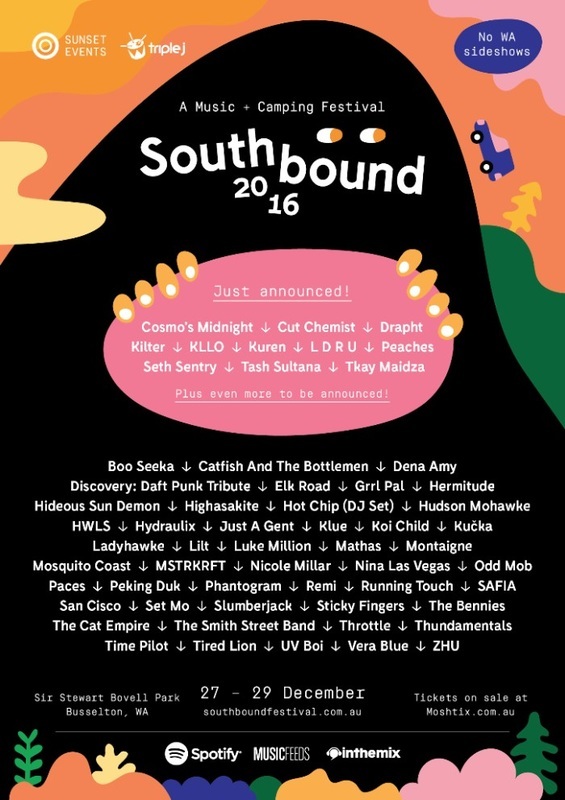 After raising over $150,000 towards the appeal with the Southbound Benefit Concert held just days after the January cancellation, the festival will continue to undertake fundraising initiatives leading up to the December event, including collection options made on ground across the three day festival. More than ever, Southbound feels strongly connected to the South West and is developing programs and strategies to cement the synergy between the local community and the festival.